In a sterile white room with a view overlooking the Park Inn Bar & Grill, shiny, new washing-machine-like devices whir and hum. Tubes of human samples from across the country automatically zip between the appliances via tunnels covered in blue-tinted plastic, reminiscent of a lab-rat run. This network of appliances — nicknamed Donald, Daisy, Huey, Dewey and Louie — are the behind-the-scenes cogs cranking out test results that tell physicians what's ailing their patients. 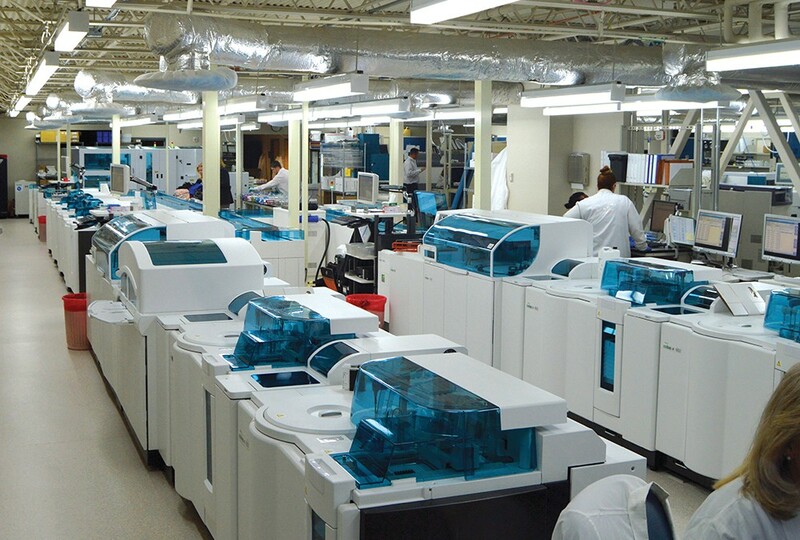 Accuracy and timeliness are imperative, which is why Spokane-based Pathology Associates Medical Laboratories (PAML) recently installed this new multimillion-dollar automated testing line. "When you're dealing with thousands of samples, and tens of thousands of tests on those samples, then it can be kind of tough looking through all that data," says David Michaelsen, laboratory technical director at PAML. "This line, and the futuristic software that it is built with, allow some of those functions to happen automatically." No other lab in the United States is using all of this technology together, which PAML estimates operates 250 percent faster than its previous testing equipment. The old equipment was installed 16 years ago, Michaelsen says. With the new technology, tests formerly done by human hands that would take eight hours are now automated, freeing up medical technicians' time. But despite the shift toward more automation, Michaelsen says, the new technology did not replace any employees. A medical technician will literally dump a load of tubes containing a variety of human samples into a silver basin to be sorted. A machine stands the tube upright, scans the barcode and shoots it into another machine for testing. Consider this example: three separate tubes containing one patient's blood get dumped into the hopper. A doctor has ordered tests on the patient's blood plasma, blood serum and the whole blood. Where a technician would previously have sorted the three tubes by hand, the new equipment now does that automatically. The technician then reads the results at the end of the line to ensure accuracy. Some test results necessitate that the sample be tested a second time. The system will recognize that and alert a technician, who then authorizes the extra test. "Not everybody has great solutions for that in the laboratory testing realm," Michaelsen says. The line also recognizes "high-priority" tests and can shuffle those ahead of other, less time-sensitive samples. Overall, the new testing line carries about 50 percent of the diagnostic testing workload for PAML, Michaelsen says. The rest is done by other machines, and for some of the more complicated tests, by human employees. "The key thing for laboratories moving forward is how well you can automate it, how well you can put in that 'smart logic,' and how well you can minimize hiring tons of people," Michaelsen says. "You're never going to eliminate jobs totally, but the key thing is how to balance that out, and part of that is an instrumentation like this." In early May, the global life sciences company LabCorp finalized its purchase of PAML, previously owned by Providence Health & Services and Catholic Health Initiatives. A Spokane-based neurology clinic — Northwest Neurological — is seeing success with a recently FDA-approved treatment for Parkinson's disease known as Duopa. Parkinson's is a chronic and progressive disease, meaning it slowly gets worse over time. Tremors, stiffness and slow movements are common symptoms caused by lack of dopamine in the brain. One of the most common treatments is a drug, known as levodopa, that replaces dopamine. However, as the disease progresses, and the body produces less and less dopamine, the drug becomes less effective. So for patients with moderate to advanced stages of Parkinson's, Duopa can be an effective solution. The difference between the gel-like Duopa and an oral medication is the manner in which they're administered. Rather than taking a pill, Duopa is sent straight into a patient's small intestine via a flexible plastic tube. The advantage is that patients get a more continuous dose, and can control dosage levels more precisely, says Dr. Jason Aldred, co-owner of Northwest Neurological. Whereas patients can only take pills in 50- or 100-milligram increments, for example, the tube offers more a fine-tuned administration of the medication. "It's like making a better wheel," Aldred says. "We had a great treatment already, but this is really good. It's the best way to deliver dopamine replacement." Aldred, who has treated about 20 people throughout the Pacific Northwest with Duopa since 2015 when it was approved, says the new treatment offers insight into the disease moving forward. "There's something about the continuous delivery that contributes to the motor state of that person," Aldred says. "Patients end up on the same amount of drugs, but their motor state is radically different. That continuous delivery contributes to that. A burst [of medicine] is not a natural way for the brain to receive dopamine."